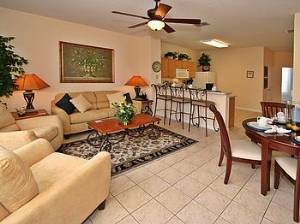 "M's Getaway" is in the heart of Windsor Palms resort community, less than 3 miles from Walt Disney World in Kissimmee, Florida. 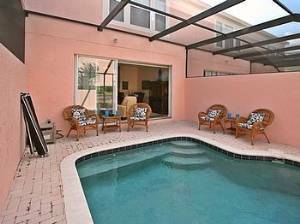 With 3 bedrooms and 3 bathrooms, this fully air-conditioned, stylish Orlando vacation home is perfect for family groups, sleeping up to 8 guests. "M's Getaway" has a spacious family room to relax in during the day or evening, with sumptuous sofa and two reclining chairs, a large flat screen cable TV, VCR and DVD - so you can watch your favorite movie while on vacation. Want to have some private-time in the pool? Enjoy the sparkling splash pool!! Or choose to sit and relax in the warm Florida sun on one of the four cushioned wicker chairs on the deck. The pool area is provided with a removable safety fence for extra added protection for young infants should you need it, and all doors leading onto the deck area have been provided with additional safety locks and switchable alarms. Sleeping accommodation at "M's Getaway" includes a master bedroom with a king-size bed upstairs, flat screen TV and DVD player, night-stand with lamp, dresser and closet space. There's a master bathroom for privacy including a soaking tub/shower. A second bedroom features a full-size bed with cable TV, DVD Player and nightstand, plus an adjacent bathroom. 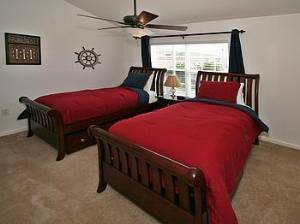 A third bedroom is perfect for the kids, with 2 twin beds, night-stand, cable TV, DVD Player, plus a full family bathroom. Finally, there's a sleeper/sofa in the family room. The bright and airy kitchen has been equipped with almost everything you could need for that quick snack, fabulous meal for two - even a family feast. Eat together as a family in the dining area and talk about the day's excitement at the parks and attractions of Orlando and enjoy time together at the breakfast bar as meals are prepared. A washer and dryer are conveniently located on the second floor. Relax in the cozy family room while watching a family movie on the large flat-screen TV. DVD player, VCR and extensive movie library. Splash around and refresh from your day in Florida in the great private pool or sit in the warm sun on a comfy cushioned wicker chair. 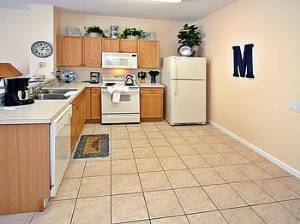 A fully-equipped kitchen including a range, microwave, dishwasher, or full-size refrigerator for snacks or meals. You can sit at the breakfast bar casual diner or gather at the dining table . 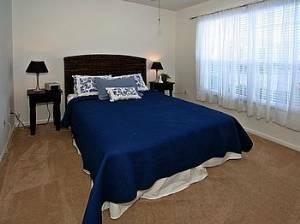 Your guest will enjoy the guest room furnished with a comfortable full-size bed. 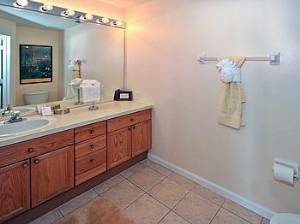 Watch their favorite show or movie on the flat screen television The adjacent bathroom gives your guests convenience. 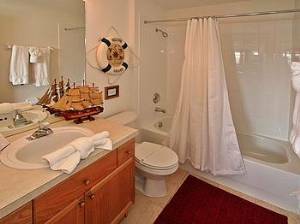 Release your stresses in the soaking tub in the Master Bath. The guest bathroom gives extra privacy for your family. Our family stayed at M's Getaway for 5 days at the beginning of October and it was everything we expected and more! Very clean, spacious and perfect for families. Our daughter so enjoyed the games, puzzles and movies that were provided. Beautifully furnished and the pool was just right for a little cool off in between the attractions. It is located in a gated resort community that also had plenty to offer and is only a few miles from all the attractions. The owner, Karen, was very gracious and helpful throughout our booking and after our vacation as well. We would recommend M's Getaway for anyone looking for a fabulous place to stay and also for a great price! We will definitely be back!! We (my wife & I plus our 3 boys) stayed one week at M's getaway on the last week of Sept 2009 and had a blast! The house is very comfortable and easily handled all 5 of us. 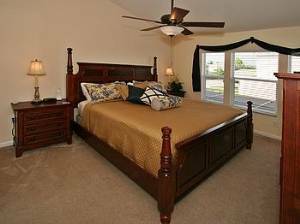 Large rooms, large kitchen, quiet and very comfortable. The resort itself is also very nice, and had some interesting activities for the boys (pool, billiards, cinema, beach-volleyball, tennis courts, etc) that kept them "busy" in between our trips to Disneyland and the water parks. Last but not least Karen was F A N T A S T I C (helped us with early check-in to match our flight schedules, always quickly available through e-mail/phone, tipped us on the good restaurants & other activities near by, promptly fixed some minor issue we had with the phone in the house, etc, etc). All in all, I can very warmly recommend to anyone planning a trip to Orlando: the house, the resort, and the owners are best in class! Daniel, Raanana, Israel, Oct 2009. My family stayed in this home for a week and a half and enjoyed ourselves to the fullest. The home was exactly what we had seen in the pictures and better than we expected. Very clean...I have a little baby so that was a plus with her crawling..walking..and getting into things..The homeowner Karen was fantastic..she is so generous and was such a blessing to our family. Karens generosity made our vacation and stay in her home wonderful. Would love to stay again and would highly recommend this property to anyone looking for a clean establishment..an excellent homeowner..and a fun time..
What a wonderful place to rest during our stay in Orlando. The furnishings were beautiful, the beds were comfortable and I had the pleasure of a bubble bath with a glass of wine. We had a long day touring Kennedy Space Center. We were so impressed with how organized the tours were of the Space Center. I have visited the space center in Houston many times and we finally got the chance to experience the facility in Florida. Thank you for making our trip so perfect. We can't wait to return to M's Getaway so we can broaden our experiences in the Orlando area. Thank you for sharing your lovely home. It was great coming back to M's Getaway after long days. My cousin met up with me as a mini get together in Florida. We enjoyed Bok Gardens while the azaleas were in bloom and I have never seen such a beautiful presentation of azaleas. We had a wonderful day long walk through the Gardens then returned for a peaceful dinner at the home. Having a glass of wine in the lanai was a perfect way to end the day. This was my second stay at M's Getaway and I look forward to returning. Deposit: $250 Deposit refundable net of any possible damages to home.